Well, our Salsa Blog was finally born today. It’s a girl! LOL. 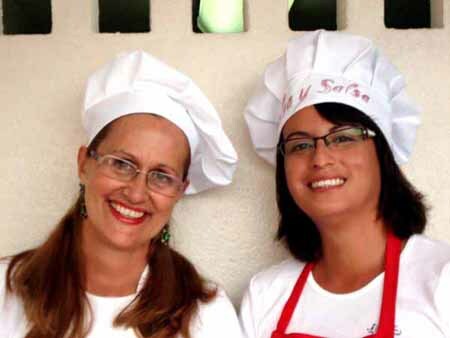 For those who have never heard of us, we are the ‘Two Dancing Chefs’, Leonique Vandeveerdonk and Pamela Hormazabal. We run a tour named ‘Salsa and Salsa’ in Mazatlan, Mexico. Now, you might just be thinking why on earth would a tour need a blog, well, the simple truth is that we see and meet over 1,000 people a month. Although we truly enjoy staying in email contact with everyone, we thought it was high time we moved with the times and got ourselves a Blog. Here, you’ll not only get to know us, (and trust me, we’re a hoot!) you’ll also get to see and hear from our guests. We want to share recipes with you, videos of the tour, videos we make purely for fun, instructional videos, as well as photos, links and lots of entertaining info that will transform you into a Mexican kitchen Virtuoso (that’s whiz, and yes I had to look it up!). The tour is made up of interactive fun for everyone who attends. 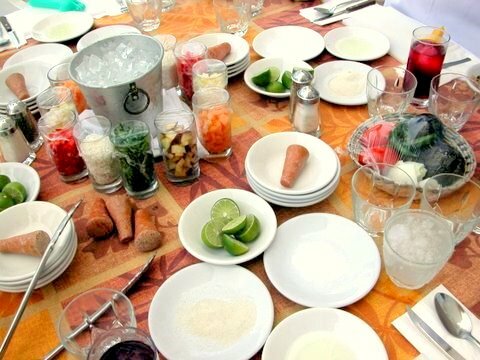 We teach people to make REAL Margaritas and then take them through step by step how to make traditional Mexican salsas. Once the salsa making class is over, we polish our dance shoes and teach everyone to dance the salsa, hence the name ‘Salsa and Salsa’ (I can see those light bulbs turning on! ). We are primarily a Cruise Ship tour, so bookings are done through a Shore Ex Rep. We service most major Cruise lines, including Carnival, Holland America, Princess and Royal Caribbean. We are currently working on a local show for non-ship days, so stay tuned for more details on that! Today, we had both Marnier of the Seas and Sapphire Princess docked, so we entertained a number of passengers. Let’s see if I can remember names…hmmm…well, we do have volunteers join us at the Head Table, so I can remember their names, Tim – who is better known as Ricky Tikki Timbo (don’t ask), Steve – who I’m sure is utterly and madly in love with his wife (he couldn’t wait to get back to the table where she was and when he did he laid a nice big kiss and told her he missed her…awww…) and we also had the newly engaged JC and his fiancee Jenny. The two Sharon’s also graced us with their presence and they sure did have a good time! The cooking is of course, only 1/2 the fun. Once we are done making salsa, we dance the salsa. I have to tell you, if I had a dollar every time a wife said “you won’t get my husband to dance Salsa”… I’m pretty persuasive, and 3 hours of drinking all-you-can-drink Margarita’s certainly helps the cause! Well, I could go on and on about the tour, but best leave you wanting to know more…stay tuned for videos and pics!